A trade war is now in progress on two fronts. The United States opened the first front by imposing a 25% tariff on steel imports and 10% tariff on aluminium imports from a large number of its trading partners. That led many damaged parties to take retaliatory actions. China was the first to respond with a 25% tariff on $3 billion worth of food imports from the US. Mexico, Turkey, European Union and Canada followed suit once it became apparent that the US would not grant them the exemption from tariff they had sought. On the second front, the US has exclusively targeted China by slapping 25% tariff on a wide variety of imports worth $34 billion from it. China hit back in this instance as well, imposing 25% tariff on $34 billion worth of imports from the US. The US has threatened China with 25% tariff on another $200 billion worth of imports. China has said it will respond in kind. Imposition of tariffs by members of the World Trade Organization (WTO) is not unusual. The General Agreement on Tariffs and Trade (GATT), which governs goods trade among WTO members, contains numerous “safeguard” provisions allowing member countries to raise tariffs under specified circumstances. What is unusual about these tariffs is that they do not fall within the domain of any of these safeguard provisions. Instead, the US has justified steel and aluminium tariffs under the rarely invoked GATT Article XXI, otherwise known as the national security clause. It has not spelt out the GATT article under which it has imposed the tariffs targeting China, but with no other provision applicable these too will have to be justified under the national security clause. As it stands, each party engaged in the trade war has formally complained against the offending party in the WTO dispute settlement body (DSB). The critical question facing DSB is how to approach the disputes involving the national security clause. The relevant provision in this clause says, “Nothing in this Agreement shall be construed … to prevent any contracting party from taking any action which it considers necessary for the protection of its essential security interests.” Accordingly, a member country may violate any WTO rule if such violation is necessary to protect its national security interests. More importantly, according to many leading legal scholars of the WTO, the member country has the sole right to decide what actions are necessary to protect its national security interests. This means that actions under this clause are beyond review by the DSB. To date, there have been very few disputes under this clause and not a single one of them has reached the review stage in the DSB or its equivalent under GATT. The dilemma the DSB faces is that if it allows a review, the US may simply walk out of WTO on the ground that such a review is forbidden under the clause. At the same time, if US actions are allowed to stand without a review, it will signal to member countries that anything is fair game so long as it is played under the national security clause. In either case, the multilateral trading system will be seriously damaged. The question then is whether the matter can be resolved through negotiations among the affected parties. Unfortunately, prospects for this are not bright either. Both the key players in this conflict, the US and China, seem determined not to give ground. From being the architect of the open world trading system in the post-Second World War era, today the United States has descended into a state in which it feels it is a victim of that same system. It aggressively seeks redress from large trading partners, notably China. China, the other major party in the conflict, is a young but equally aggressive power. 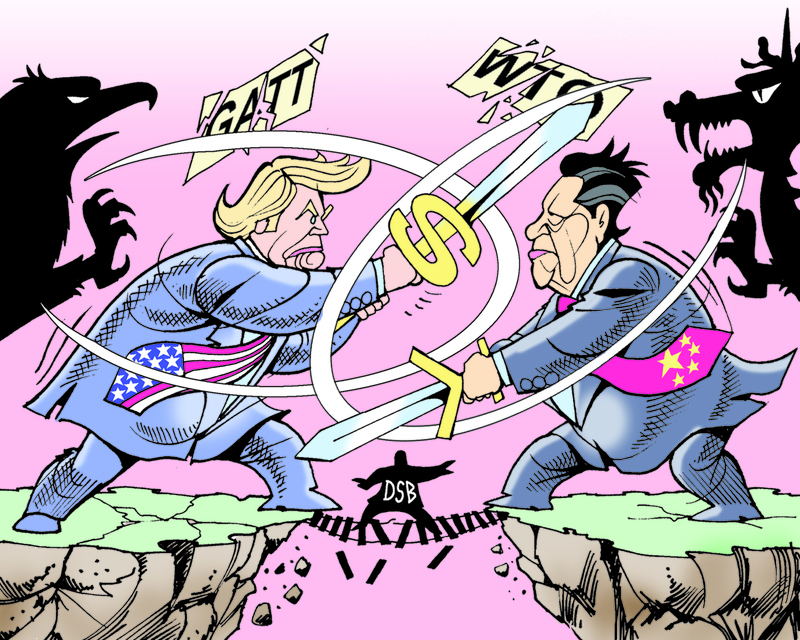 Judging by its assertive posturing in South China Sea and Belt and Road Initiative, prospects that it will retreat from the battle are bleak. It has already made good on its promise of retaliation in both cases involving it and has made clear that it will respond in kind to any further actions by the US. In the immediate future, the only hope is that after midterm elections in November, President Trump would return to a more conciliatory position. If not, serious damage to the trading system is inevitable. A Panglossian may still argue that the vast damage that a wider trade war would inflict would at last convince political leaderships that trade openness is not the enemy, protectionism is. If so, this would be a replay of history that saw the highly prosperous First Globalisation from 1870 to 1914 descend into escalating protection during inter-war years. Lessons learned from that phase of protectionism brought the global leadership together to build what came to be known as the GATT-WTO system.